When our local daughter-in-law was planning to visit her family in Denmark she asked me if I would want to watch the three younger children for two weeks. Of course I jumped at the chance! I thought of things I could do while caring for the sweet three-year-old during the day before the older children returned home from school. When I received a flyer with fall classes available at Country Woolens I found that The Wonderful Wallaby was going to be one offered class. I had been dying to make that sweater for years. I have purchased the pattern booklet at least once before, and I think twice. Well, I signed up for the class and purchased the pattern booklet again( as locating the previously purchased booklet was impossible), as well as yarn and another set of size six 16″ circular needles. Again. The total cost was somewhat staggering but since I had just received mileage reimbursement for a genealogy class, I felt I could make the purchase. Preparing for the first class by knitting the ribbing went well. At the class we began the process which would create the kangaroo pouch plus the lower body of the sweater. 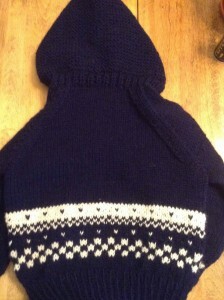 I decided to do a little pattern with white on the navy blue body of the sweater which B had chosen for his yarn. At the end of that first class I was really up for this knitting project. So glad to finally be working on it. I imagined making many of these wallabies…. During days babysitting I got the sweater knit up before the end of the two-week stint. B tried it on and was thrilled with the kangaroo pouch pocket where he could “touch his hands together”. 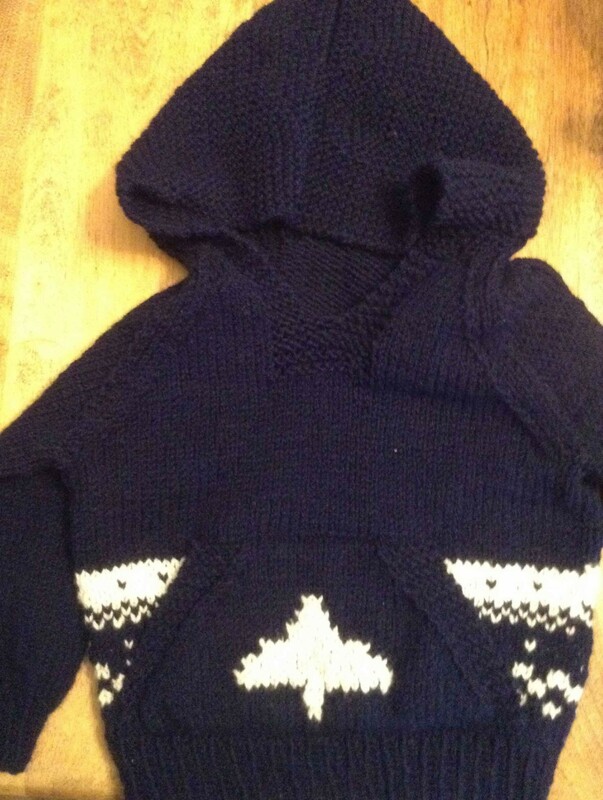 This sweater was knit in size 4 using US size 6 and US size 8 needles and Plymouth Encore yarn. My gauge was slightly larger than specified but I thought it would work all right for a growing boy. He will be able to wear it at least through the fall. My plan was to also knit a size 8 or 10 for C but my hands wore down from the knitting. I guess arthritis is a reality… Even hand-knitting a pair of requested mittens seems beyond me today. Fortunately I have finally gotten the new-to-me old Brother KH800 knitting machine cleaned and lubricated and even knit preliminary gauge swatches.